In June 2011, I embarked on what has become an annual adventure. Every year, I head out with a couple friends and go on an adventure. In 2009, I went to Hong Kong. In 2010, I went to Shimane. This year we decided to go to Taiwan. It is a small island where, to be honest, I wasn’t very interested in visiting. My family is originally from Hong Kong which meant that I grew up eating Cantonese food and hearing Cantonese wherever I went. I love to eat Chinese food, but specifically Cantonese food. I had no real images of Taiwan except for the image that it was a cross between China and Japan, culturally. Little did I know that Taiwan was more Japanese than I could have expected. 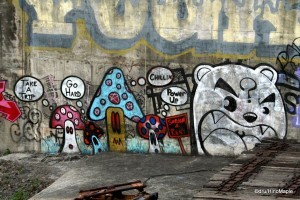 Graffiti is rampant in Taipei, but it's very good. Living in Japan means flying to Taipei is very easy. I was able to fly directly from Haneda Airport to Songshan Airport. Both airports are located in the downtown cores. When leaving Tokyo, I could enjoy the view of Tokyo as we departed and on approach I could see Taipei 101. 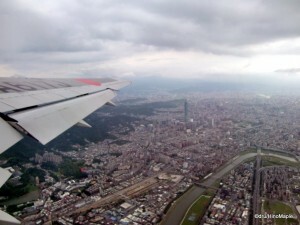 It is a very convenient flight and one that makes visiting Taipei much easier. When I researched Taipei, I learned about Taoyuan Airport which is similar to Narita Airport in Tokyo. There are no direct trains to the Taoyuan Airport and I’d have to take a bus if I flew there. I was relieved when I found out I could fly to Songshan and just take the train in. Songshan airport itself is pretty simple. There are only a few gates as most flights are designed for domestic travel only. In fact, Songshan Airport is a little ghetto but they are undergoing renovations to improve the facilities a little. Upon my arrival at Songshan Airport, I was greeted by a wall of heat and humidity. It was a little difficult to survive as Tokyo was still in the process of heating up to summer temperatures and summer humidity. The heat an humidity at this time made it a little difficult to get around but thankfully my hotel was located in a central location. It was close to the electronics area and a short walk to an area near Daan Park with great food. One of the first places I visited was Ximen. It is a bustling commercial district with lots of trendy shops. It is akin to walking around Shibuya in Tokyo. Lots of young people walking around, but to my surprise there was a lot of Japanese shops. Everywhere I walked there was a Japanese shop somewhere. I couldn’t get past it. I found a lot of famous Japanese shops but mostly Japanese restaurants. It wasn’t all Japanese as I saw a lot of Taiwanese shops and restaurants too. Being a commercial district, there was a large karaoke shop nearby where people gather to enjoy singing but from what I heard they enjoy the food a lot more. 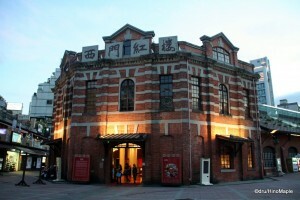 Walking around Ximen will eventually bring you to the cinema district where you can enjoy movies at a relatively cheap rate. Compared to Tokyo, the movies were dirt cheap. On the other side of the commercial district was a red brick square. I forget the name of the area but I found out that it was the gay area of Taipei. It was supposed to be like going to Nichome in Shinjuku, but I found it to be just a simple bar area. Since I visited the area on a weeknight, there were very few people there but the drinks were fairly priced and the atmosphere was relaxing. 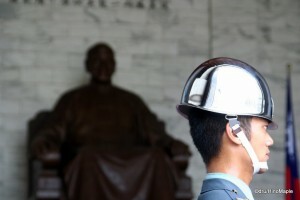 The Chiang Kai-shek Memorial Hall, or CKS Memorial for short, is one of the few tourist areas that I visited in Taipei. I spent a lot of time enjoying the food and seeing the city. The CKS Memorial is a huge complex with 2 large halls, a huge gate, and the memorial itself. All of this is nestled within a large park. I never got the chance to visit every corner of this park but I did see all of the main points. The two halls were not so special but unfortunately I only visited one of them. The exteriors of the two halls were more interesting than the interiors. I’m not too sure on the completion date of the halls but the interior of the hall I visited was very modern. If I’m not mistaken, it also served as a theatre which made it less interesting for tourists. The main gate is a famous point for tourists and can be difficult to get good photos depending on the time of day. The main gate usually has tourists passing in and out of it at all times making it difficult to get the perfect shot. Pictures can never put the size into scope. It is much larger than any picture could have conveyed to me. The memorial hall itself is where all the action is. During the day, they open the doors and have a ceremonial changing of the guard every hour on the hour. It is a slow 15 minute ceremony where the guards change from their platforms and show their ceremonial guns. I wasn’t particularly interested in seeing the ceremony but I just happened to be there as they started. I would recommend taking in the ceremony if you happen to be there during the ceremony. The night view at the CKS Memorial is also very interesting. I highly recommend bringing a tripod if you want to take pictures at night. It is popular for young couples to just hang out and make out around the complex. It can look romantic but there really isn’t enough privacy for couples. 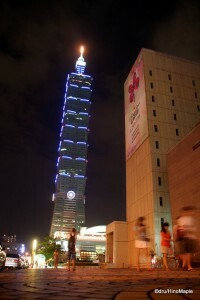 Taipei 101 is currently the second tallest building in the world. It is a popular area with many high end shops. The building complex itself is not that great but the trip up to the top is a must for any typical tourist. It is a little expensive but the trip up is very quick. It takes less than a minute to get to the top thanks to the world’s second fastest elevators, conveniently built by Toshiba. The view from the top is a typical observation deck view. In reality, I find that when going to observation decks around the world, the view is very similar. The vantage point is different but the appeal quickly goes away. You get up there and look out the windows and within a few minutes you feel as if it isn’t special anymore. Taipei 101 is not immune to that feeling but I don’t regret going up. My only regret is that the outdoor observation deck was closed when I visited and I couldn’t go outside to the roof. The observation deck can get very crowded at times and extremely noisy. When I visited, I saw waves of tour groups go past listening to their guided tour devices. I also happened to see a group of Chinese models visiting and doing a promotional photo shoot and video. It was interesting but more annoying than anything. There are 3 areas of the observation area. The main area is where you can take pictures of the surrounding areas. You can go upstairs to the 91st floor which has the outdoor observation deck. Going down a floor takes you to the exit. Before you leave you go through the Tuned Mass Damper which is the largest in the world. It is designed to reduce swaying of the building during earthquakes and strong winds. After a visit to the damper you must walk your way through a sales area that specializes in coral sculptures and jewelry. It is your typical rich person money grab and I’m sure they do enough business to get by. Of course this is just the surface of places to visit within Taipei. It’s difficult to see and do everything in a few days but I’d say it’s sufficient to get a feel of the city. Personally, I can’t see myself spending more than a few days in Taipei itself. If I spent more time there, I’d have to get out a lot more and do a lot more outside the city. If you plan to only visit the city, you’ll only need a few days at most. After that things tend to get boring or repetitive. This is especially true if you have visited other East Asian cities such as Tokyo and Hong Kong. Taipei is part of a multi part series of my trip to Taiwan. Please continue reading about Danshui, Taiwan and Food in Taiwan. 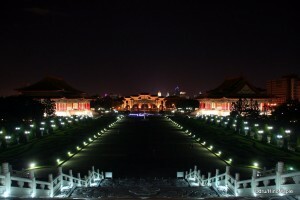 This entry was posted in East Asia and tagged 101, Chiang Kai Shek Hall, Chiang Kai Shek Memorial, Chiang Kai-shek, Chiang Kai-shek Memorial Hall, China, Chinese, CKS Hall, CKS Memorial, CKS Memorial Hall, Daan, Daan Park, food, observation deck, Songshan, Songshan Airport, Taipei, Taipei 101, Taiwan, Taoyuan, Taoyuan Airport, Ximen by Dru. Bookmark the permalink.